Leather has been of use to man since the early humans began to hunt with their spears. People have and still use different types of leather to make various goods, from leather clothing to contemporary art and design elements. We used leather in horse carriages long before Karl Benz built his famous Benz Patent-Motorwagen in 1886. With all this in mind we need to remember that no two leather materials are the same and before we try any of the fancy products available at every car dealers shop, there is this very basic thing we need to determine first – what type of leather is the interior of my car made of? There are different types and different ages of automotive upholstery leather just like there are different kind of animals the leather is derived from. Some extreme examples include cowhide seats or ostrich leather seats, however in modern practice cattle skin has been most commonly used as an upholstery material for car interiors. 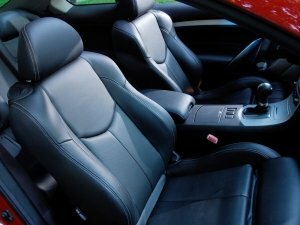 Once you know the type you need to determine the age and finish of your leather seats, dashboard wheel cover and other leather interior elements in order to use appropriate products and techniques to clean, rejuvenate and protect the leather upholstery. We don’t recommend you fix any damaged material on your own. It is okay to do some basic maintenance work but in case of serious skin damage it is wise to call professional and get them to restore it for you. 1. There’s an old trick to find out what type of automotive leather we’re dealing with – the water rubbing test. You need to rub a drop of water, ideally in some hidden area of the upholstery and watch if it stays on the surface. If it does, then you can tell it has some kind of protection on it, may it be paint or pigment coating – this is good news and you will be able to clean the surface with a water based cleaners. In case the water penetrates the skin surface we advise to consult a specialist for professional advice. If you attempt to clean uncoated leather on your own you may end up with endless marks and blemishes as this type of skin is extremely sensitive to water. 2. We can do another test to determine how dirty are the seats and the interior of your car. Spray some cleaner on a cleaning cloth and wipe the area to see if the cloth is soiled. If it’s clean then not much work is required apart from some basic maintenance and cosmetic touch, and if the cloth is soiled then you’d better get your cleaning gear ready as it look like your car interior needs some attention. 3. Clean Car Leather maintenance – for all new, matt, bright, sensitive leather that is being used heavily on a daily basis we recommend products that offer protection shield in contact areas. For older and dull leather that’s lost its shine we recommend quality leather protector to prevent it from further degradation. For shiny areas, we recommend waterproof and colour protection and for hardened areas some good quality leather softener. 4. For all cars that failed our first test, before you start cleaning remember that soft sponges and brushes, ideally 100% natural, are always the best choice. You can try it on your own skin. If you press and it doesn’t hurt or mark your skin, then it’s just right to clean the leather interior of your car. For a routine cleaning always opt for mild strength cleaner and if the dirt is old and persistent you can try a stronger option. Cleaning and applying products in circular motion won’t leave any wipe marks. Remember do to it gently. Use slightly damp cloth to remove dirt, clean the cloth in clean water and wipe again, leave to dry. If your leather car upholstery needs cleaning and professional attention don’t hesitate to call our London workshop, our team will be delighted to help.